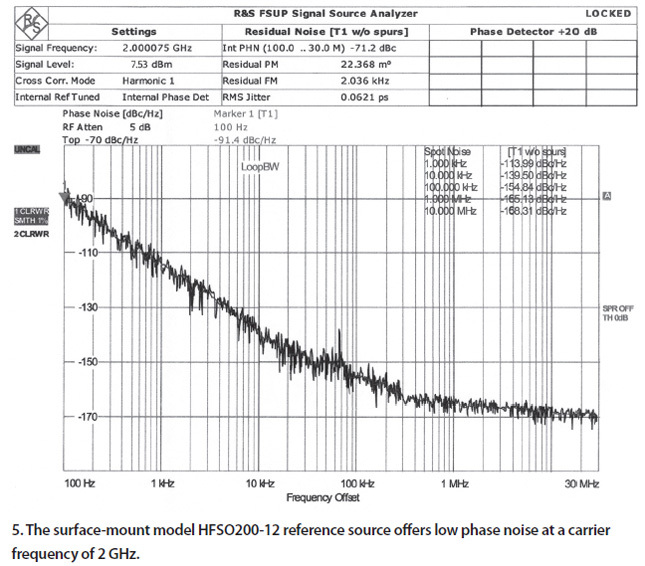 Phase-noise measurements for the HFSO and FCTS reference sources were made with both the Agilent E5052A Signal Source from Agilent Technologies and the R&S FSUP Signal Source Analyzer from Rohde& Schwarz. 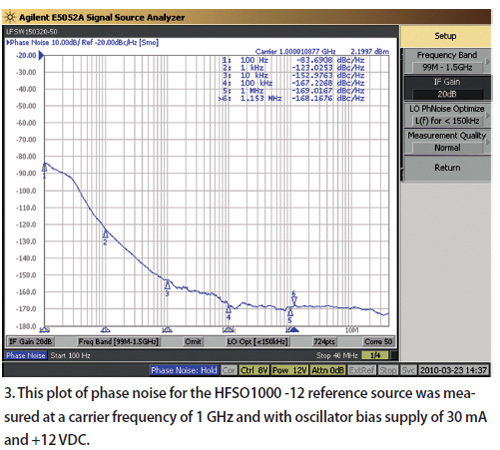 The phase noise for the HFSO1000-12 reference oscillator (Fig. 3) was measured with an Agilent E5052A Signal Source. The measurements, with the source running from a +12 VDC, 30 mA supply, and show typical tuning range of 100 kHz and phase noise of -153 dBc/Hz offset 10 kHz from the carrier. 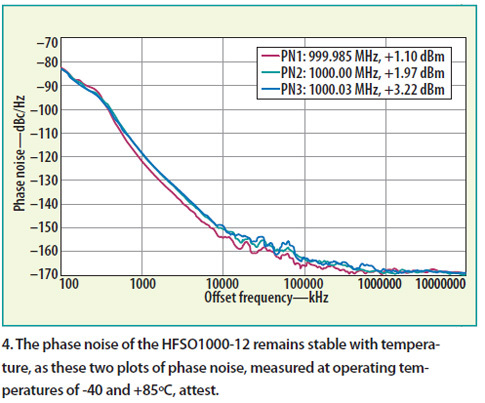 The phase noise for the HFSO1000-12 over temperature (-40 to +85ºC is fairly consistent (Fig. 4). The table provides a summary of the HFSO1000-12’s performance. 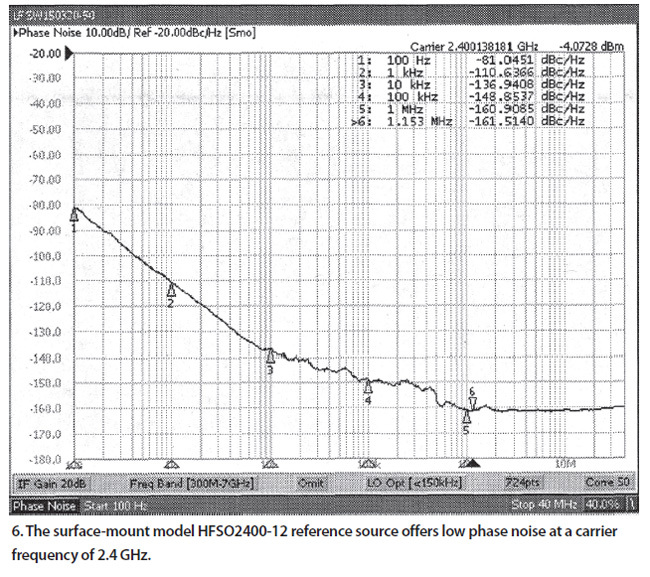 A model HFSO2400-12 reference oscillator operating at 2400 MHz was also evaluated, characterized with phaseinjection techniques in Class-C states using an Agilent E5052A Signal Source (Fig. 6). It was operated with 30 mA current at +12 VDC and yielded -4.07 dBm output power with 15-dB harmonic rejection. 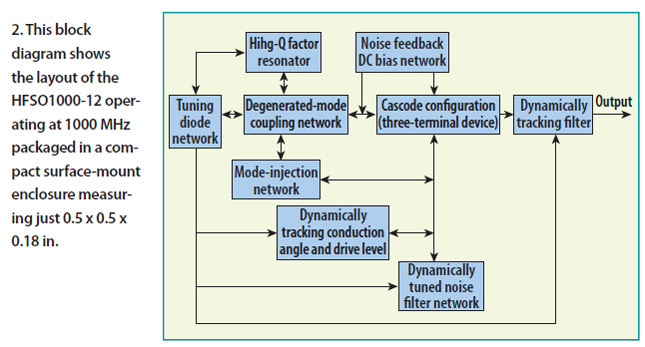 For the self-injection locked multiplier techniques used with this source, the typical phase noise at 10 kHz offset from the carrier is –136 dBc/ Hz.14-18 The reference oscillator features a tuning voltage range of 0 to 12 V to correct for any frequency shift due to aging and temperature effects. 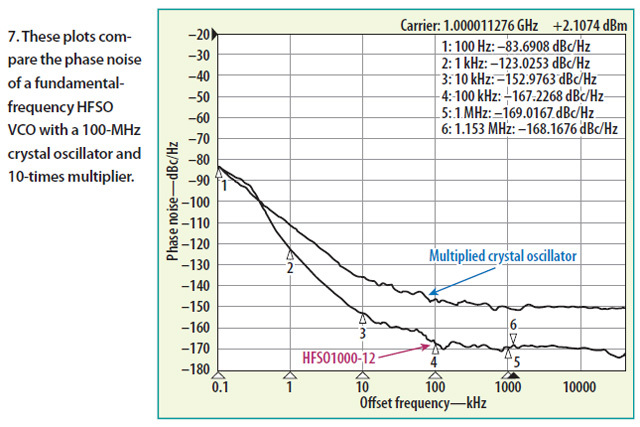 The free-running HFSO oscillators and phase-locked FCTS sources can be specified in standard and custom frequencies, and in coaxial or surfacemount packages. Synergy Microwave Corp., 202 McLean Boulevard, Paterson, NJ 07504; +1-973-881-8800; FAX: +1-973-881-8361, e-mail: sales@synergymwave.com, Internet: www.synergymwave.com. U. L. Rohde, A. K. Poddar, and R. Rebel, “Integrated Low Noise Microwave Wideband Push- Push VCO,” United States Patent No. 7,088189, August 2006. U. L. Rohde and A. K. Poddar, “User-Definable Thermal Drift Voltage Controlled Oscillator,” United States Patent No. 7, 265,642 B2, Sept. 4, 2007. U. L. Rohde and A. K. Poddar, “Low Thermal Drift Tunable Frequency Voltage Controlled Oscillatory,” United States Patent No. 7, 262,670 B2, Aug. 28, 2007. U. L. Rohde and A. K. Poddar, “Tunable Oscillator,” US Patent No. 7, 292,113, Nov. 6, 2007. U. L. Rohde and A. K. Poddar, “Multi-Octave Band Tunable Coupled-Resonator Oscillator,” United States Patent No. 292,113, Nov. 6, 2007. U. L. Rohde and A. K. Poddar, “Low Noise, Hybrid Tuned Wideband Voltage Controlled Oscillator,” United States Patent No. 7,365,612 B2, April 29, 2008. U. L. Rohde and A. K. Poddar, “Tunable Frequency, Low Phase Noise and Low Thermal Drift Oscillator,” United States Patent No. 7,545, 229, June 9, 2009. U. L. Rohde and A. K. Poddar, “User-Definable, Low Cost, Low Phase Hit and Spectral Pure Tunable Oscillator,” United States Patent No. 7,586,381 on Sept. 8, 2009. U. L. Rohde and A. K. Poddar, “User-Definable, Low Cost, Low noise, and phase hit insensitive multi-octaveband tunable oscillator, Phase Hit and Spectral Pure Tunable Oscillator,” United States Patent No. 7,605,670, Oct. 20, 2009. A. K. Poddar, S. K. Koul, and Bharathi Bhat, “Millimeter Wave Evanescent Mode Gunn Diode Oscillator in Suspended Stripline Configuration,” Infrared and Millimeter Waves, 22nd International Conference, July 1997, pp. 265-266. A. K. Poddar, J. K. Bansal, and K. N. Pandey, “Millimeter Wave Evanescent Mode Power Combiner Gunn Oscillator in Suspended Stripline Configuration,” Mathematical Methods in Electromagnetic Theory, IEEE/MMET, International Conference, June 1998, pp. 384-386. U. L. Rohde and A. K. Poddar, “Novel Multi-Coupled Line Resonators Replace Traditional Ceramic Resonators in Oscillators/VCOs,” IEEE, International Frequency Control Symposium, IFCS, Florida, June 5-7, 2006. A. K. Poddar and U. L. Rohde, “A Novel Voltage Controlled Crystal Oscillator (VCXO) Circuits,” 9th International Conference on Telecommunications in Modern Satellite, Cable and Broadcasting Services, TELSIKS 2009, Serbia, Oct. 7-9, 2009. U. L. Rohde and A. K. Poddar, “Electromagnetic Interference and Start-up Dynamics in High Frequency Crystal Oscillator Circuits,” 2010 IEEE Sarnoff Symposium, Princeton, NJ, April 12-14, 2010. U. L. Rohde and A. K. Poddar, “Impact of Radiated EMI in High Frequency Crystal Oscillator,” IEEE International Microwave Symposium 2010, Anaheim, CA, May 23-28, 2010.